Shared Rooms: Cancellations must be made 3 days (72 hours) before check-in. Groups of 12 or more: Contact hostel directly by emailing Serena@NotchHostel.com or calling 603 348 1483 to reserve. Special conditions, including a 30% non-refundable deposit apply. 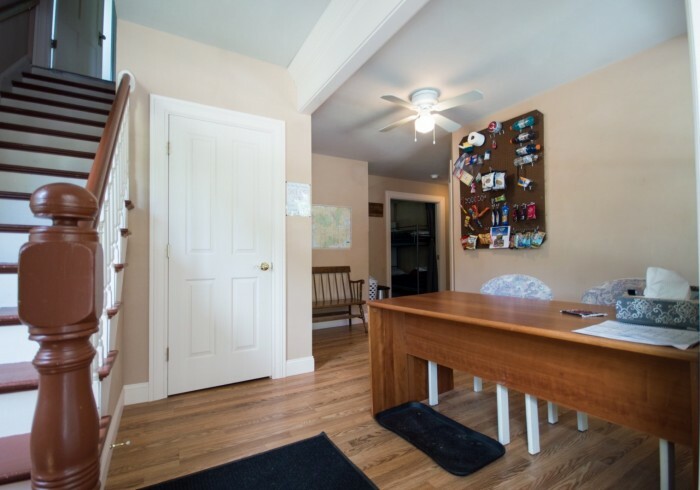 The Notch Hostel booking terms and conditionsTerms and conditions for the provision of services at The Notch Hostel, LLC of 324 Lost River Road, North Woodstock, NH 03262. 3.1 If the Hostel confirms a reservation by any method (telephone, email message, online booking system or other method) the Contract is conditional on the Guest supplying valid credit card information at the time of the reservation. The Hostel may make exceptions at its discretion. The authority for charges (including any cancellation charges) shall be levied, on the payment terms in the Schedule.3.2 If the credit card details and authority are not provided to the Hostel by the Guest then the Contract will cease to have effect, except for any liability (including any cancellation charges) accrued by the Guest. The Services that had been subject to the reservation may then be re-sold by the Hostel. 4.1 The Hostel will supply the Services to the Guest under the Contract.4.2 The Guest shall at his / her own expense supply the Hostel with all necessary information relating to the Services within sufficient time to enable the Hostel to provide the Services in accordance with the Contract. The Guest shall ensure the accuracy of all such information.4.3 The Hostel may at any time alter the Services:4.3.1 to comply with statutory requirements (including those regarding health and safety health, or4.3.2 out of unforeseen necessity, and4.3.3 in any event, provided that the standard of the Services is not diminished. 5.1 The charges payable by the Guest shall be specified in writing by the Hostel, provided that where no charges are so specified or other Services are provided to the Guest, the Guest shall pay for those Services at the rate of the published Standard Charges for the day on which the Services are provided.5.2 The Standard Charges may be varied from time to time.5.3 Taxes may not be included in the advertised costs of Services. 5.4 If the Guest inhibits another guest’s ability to enjoy the Hostel or use the Hostel Services provided to guests, the Guest shall pay for the affected guest’s room or bed charge and for any damages caused. Deposits are non-refundable and the requirements for them are specified in the Schedule.5.4 If the Guest inhibits another guest’s ability to enjoy the Hostel or use the Hostel Services provided to guests, the Guest shall pay for the affected guest’s room or bed charge and for any damages caused. 6.1 Upon confirmation of the booking, we shall request credit card details from you.6.2 All personal and credit card details will be stored in line with Data Protection laws.6.3 We shall charge your card only where you do not show, or if you cancel (in line with the cancellation charges in the Schedule), or if the Guest leaves the Hostel without paying in full. 7.1 The payments to be made to the Hostel by the Guest (including deposits) are to be made on the date and in the amount to be calculated as specified in the Schedule.7.2 If any of the Services under the Contract are varied prior to arrival then the payments shall reflect the latest details contained in the Hostel’s literature.7.3 Any additional charges due to the Hostel from the Guest for the Services shall be paid by the Guest on presentation of an invoice. 8.1 Arrival and departure times for accommodation are posted on the Hostel website.8.2 (blank)8.3 The Guest is responsible to ensure the good conduct of his guests in the Hostel and, inparticular to ensure that they cause no nuisance or annoyance to any person and that they cause no personal injury or physical damage.8.4 The Guest has an obligation to ensure:8.4.1 that he does not leave or render any part of the Hostel insecure,8.4.2 that he does nothing to cause a fire,8.4.3 that he complies with directions on all notices posted in the Hostel, such as fire notices, and policies, such as quiet hours and the Hostel alcohol and drug policy (no more than a couple beers or glasses of wine, no hard alcohol, no drugs), and8.4.4 that he leaves the keys at reception when he checks out the Hostel. 9.1 The Guest agrees to pay charges to the Hostel in the event of cancellation of the booking of the Services or if the Guest fails to take up the Services at the time and on the day that they were booked for.9.2 Cancellation charges shall be calculated as specified in the Schedule.9.3 Cancellation charges may, in the discretion of the Hostel, be refunded if the Hostel re-sells the Services for the period which are subject to the cancellation. Any variation to the initial Contract must be agreed in writing between the parties. 11.1 The Hostel shall have no liability to the Guest for any loss, damage, costs or expenses or other claims for compensation arising from any instructions supplied by the Guest which are incomplete, incorrect, illegible, out of sequence or in the wrong order or form, or arising from the Guest’s late arrival, non-arrival or any other fault of the Guest.11.2 Except in respect of death or personal injury caused by the negligence of the Hostel, or as expressly provided in these Terms, the Hostel shall not be liable to the Guest by reason of any innocent representation or any implied warranty, condition or other term, or any duty at common law, for any loss of profit, opportunity or any indirect, special or consequential loss, damage, costs, expenses or other claims (however caused) which arise out of or in connection with the provision of the Services (including any delay or failure to provide them) or their use by the Guest, so however that, the entire liability of the Hostel under or in connection with the Contract shall be limited to the amount of the charges for the provision of the Services in question. 12.1 Guests who bring dogs or other pets to the Hostel must abide by the Hostel dog policy as described here.12.2 Guests may only allow their pets to urinate or defecate outside. Guests must pick up and properly dispose of their pet’s feces at all times.12.3 Guests must keep their pets in sight at all times. Guests may not leave their pets in their bedrooms unattended. Guests may not leave their pets at the hostel unattended. Guests may not leave the Hostel without their pet.12.4 Guests are responsible for paying to repair any damages caused by their pet, whether to the Hostel property, personal property of the Hostel owners, or to another Guest or visitor at the Hostel.12.5 Pets must be up to date on shots and heath12.6 A refundable damage deposit of up to $10 per stay may be required of all guests with a pet.12.7 Pets who are unfriendly or create a chronic disturbance must stay outside. 13.1 If the Guest:13.1.1 commits any material breach of these Terms,13.1.2 has a trustee receiver, administrative receiver or similar officer appointed in respect of all or any part of the business or assets of the Guest or if a petition is presented or a meeting is convened for the purpose of considering a resolution or other steps are taken for the winding-up of the company or for the making of an administration or bankruptcy order (otherwise than for the purpose of amalgamation or reconstruction), the Hostel may at any time terminate the Contract by giving written notice to the Guest.13.2 Any termination of the Contract under this paragraph shall be without prejudice to any other remedies available to the Hostel. 15.1 If any of these terms is at any time held by any jurisdiction to be void, invalid or unenforceable, then it shall be treated as changed or reduced, only to the extent minimally necessary to bring it within the laws of that jurisdiction and to prevent it from being void and it shall be binding in that changed or reduced form. Subject to that, each provision shall be interpreted as independent and severable from each other paragraph and therefore separately enforceable.15.2 No delay by the Hostel in exercising any right, power or provision hereunder shall operate as a waiver of the exercise of any right at a future time. Charges for accommodation are listed on the Hostel website and are subject to change. Cancellations within 24 hours of check-in will be charged the greater of EITHER 30% total reservation cost OR 100% of first night cost. The Notch Hostel offers affordable accommodations in the White Mountains, NH. We offer shared bunk rooms and private rooms for hikers, climbers, cyclists, skiers, snowboarders, and other White Mountains visitors. Just one mile off Rt. 93 at Exit 32 (Lincoln / N. Woodstock / Kancamagus Hwy / Loon Mtn). Make us your White Mountains base camp! For large groups, dogs, or extended stays, please call us!